Analog Artist Digital World: Ludovico Einaudi in concert. 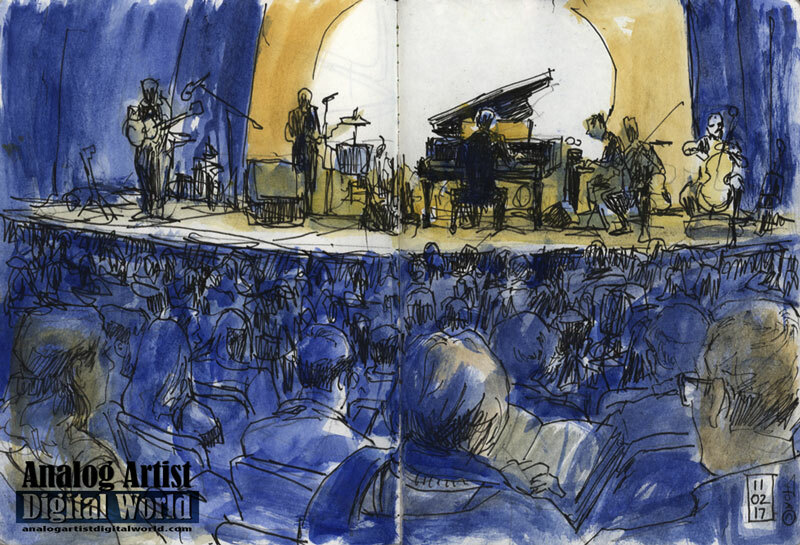 On a recent tip to Princeton, New Jersey, I arranged to sketch a concert by Ludovico Einaudi at the McCarter Theatre Center (91 University Place, Princeton, NJ 08540). Ludovico Einaudi is a renowned pianist and composer. The Italian musician was born in Turin, Italy where his classical career began, before he moved on to create music for film with influences of pop, rock, and folk music. Einaudi began his career performing classical music in the 1980s after training at the Conservatorio Verdi, when he began composing orchestral and classical pieces, before progressing to more main stream music heard in popular culture in the mid 80s. As well as piano, he plays and composes for guitar, in which he is incredibly skilled and proficient. Although Einaudi is influenced by classical artists, his style is unique with the fusion of classical and popular music bridging the gap between the two genres, making his music extremely accessible to many types of listeners. From his eclectic back catalogue of tracks he has won several awards, including Best Film Music at the Avingon Film Festival and Best Soundtrack at the Italian Music Awards. His music has also appeared in popular culture worldwide, composing the trailer music for the movie Black Swan. His album Le Onde written for piano and performed as a solo was the best selling album in the UK and Italy, sending Einaudi to success. Still producing charting music, his latest album "In A Time Lapse" has taken him on a giant US and Canadian tour, as well as landing him a slot at the prestigious iTunes festival. The house lights were dark for the entire evening, so I struggled to see my sketch by the dim light of my cell phone. Through the first half of the concert, he was joined on stage by a guitarist, violin, cello, a second electronic pianist and a percussionist. The lighting was stark with spot lights on each performer. The music is mesmerizing, leaving the impression of a dream state. The other performers left the stage and then Ludovico performed a solo that lasted forever. There were periodic pauses where he held his hands suspended over the keys and then the music resumed. The percussion in one piece had a sheet of metal suspended in a vat of water. The metal would be shaken to produce thunderous sounds muffled by the liquid. It was an experimental way of producing unexpected mysterious sounds. Overall it was an amazing concert and if we ever have a chance to see him in concert again, would jump at the opportunity.